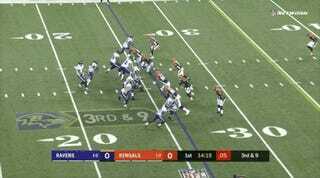 The clip above shows Bengals defensive tackle Geno Atkins chasing down a quarterback for a sack in the open field. 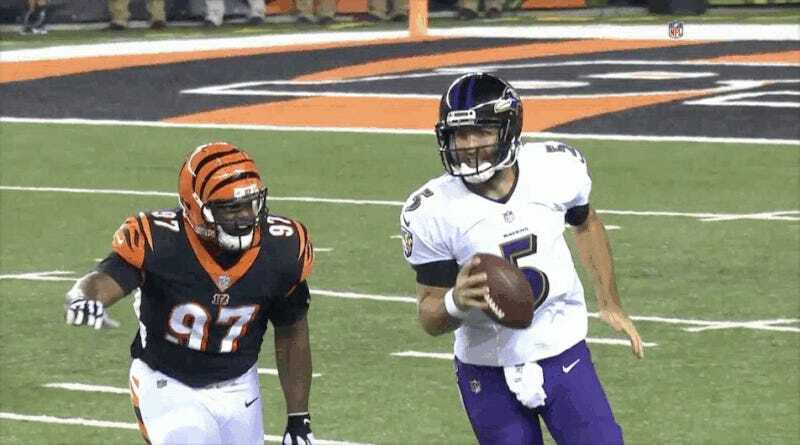 So what if Ravens QB Joe Flacco isn’t all that fleet of foot? Atkins weighs 300 pounds. Like a bowling ball rolling downhill, he quickly covered a lot of ground to make that play. It happened on the third snap from scrimmage, and it was a prelude for much of what was to come, as the Bengals improved to 2-0 with last night’s 34-23 win. Atkins is a two-time first-team All-Pro, and he’s been to six Pro Bowls in his first eight seasons. The only season since his rookie year in which he failed to get picked for the Pro Bowl was 2013, when he tore his ACL. Atkins turned 30 in March, but the Bengals signed him to a contract extension that will pay him $37.5 million in the first two years. Cincinnati also recently extended the contract of defensive end Carlos Dunlap. 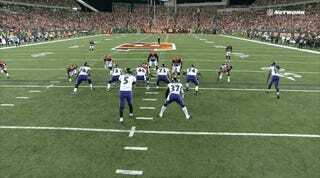 The Bengals clearly see the value in having a deep rotation along their defensive front—seven D-linemen played at least 40 percent of the snaps against the Ravens—and last night it showed. Atkins earned his second sack later in the first quarter, this time by lining up over center Matt Skura, who gets knocked straight back at Flacco, who has to pull down his throw because of solid coverage. 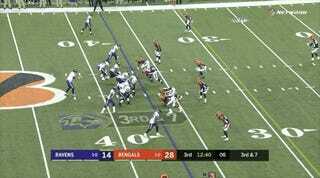 Before Flacco can reset again, Atkins is on his back pulling him to the ground. 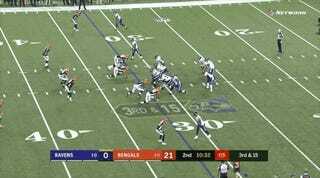 This play went for a long gain, but not before Atkins tossed left guard Alex Lewis aside like a rag doll. 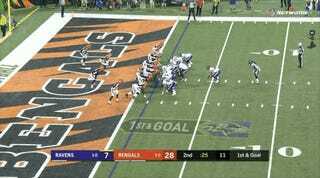 In another instant, Atkins might have had Flacco down again. Here’s more of that speed, with Atkins again blowing by Lewis and almost getting to Flacco. How about a run-stop highlight? Here, down on the goal line, is Atkins worming his way up the line by getting under left tackle Ronnie Stanley, who helplessly gives chase as Atkins prevents Alex Collins from scoring.